Now research exists to show what we all thought about the importance of a good breakfast. Those who start the day with cereal, bread, dairy or fruit were twice as likely to do well in tests, a Cardiff University study found. Having snacks such as crisps or sweets in the morning was no better than eating nothing at all, they said. Researchers who asked 5,000 pupils aged nine to 11 from more than 100 primary schools found that youngsters who carried on eating fruit and vegetables at other times of the day also did better. While academics have long linked morning meals to brain power, the Cardiff team said their large study indicated the ‘strongest evidence yet’. Dr Graham Moore, who worked on the study, said: ‘We analysed links between whether young people were eating breakfast and the quality of that breakfast. 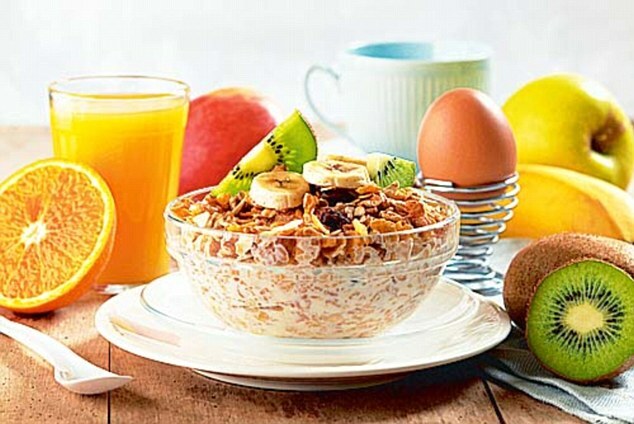 ‘There’s a significant association between eating breakfast and doing well, but there is also a link between a healthy breakfast and doing well.